Eric Dungey looks to throw against Wagner. Mandatory Photo Credit: Kicia Sears, The Juice Online. Syracuse is 4-0 and will try to enter the top 25 for the first time since 2001 when it heads to Death Valley to play Clemson. Ahead of the game, The Juice Online’s Brad Bierman and Wes Cheng gave their predictions for the game. BRAD BIERMAN (Season Predictions, 4-0): This game is hard to handicap, other than the fact that the Tigers have superior starting talent and depth across the board, despite the in-roads Dino Babers and staff has made with their three recruiting cycles, and CU is playing in front of 80,000 plus diehards. But it’s still hard to gauge because Syracuse has Eric Dungey and he’s been the best quarterback in the ACC after a third of the season. We’re all in. We believe in the “we want to annihilate our opponents” mindset Dungey has installed as the team leader. If he stays healthy, and the track record says that’s a big “if,” Dungey is going to have a rare season, already one of just five Orange football campaigns to begin 4-0 since 1942, and we think of some similarities to Don McPherson coming out of nowhere to escalate a pretty decent career and produce his 1987 wizardry and runner-up spot for the Heisman Trophy. We also don’t think the Trevor Lawrence factor, the Clemson all-everything freshman quarterback ascending to the starting job in just his fifth game as a collegian, while sending incumbent Kelly Bryant seeking a destination for his graduate transfer year of eligibility; will have any effect on how the Tigers perform on the field. They are going to play like the No. 2/3 ranked team in the country. » Related: Would a 6-6 season be a disappointment for Syracuse football? In the end, we simply have a feeling that Dungey is going to add another banner week to a season in which he’s already been twice named the ACC quarterback of the week, and the Orange vibe of Syracuse’s honoree announced this week as its legend player to be saluted the weekend of the ACC Championship game in Charlotte, Nov. 30-Dec. 1, is none other than…Don McPherson. Syracuse 30-Clemson 28. Syracuse is back in the Top 25 polls next week for the first time since 1991. WES CHENG (Season Predictions, 3-1): I knew the Trevor Lawrence era was born when Lawrence, rolling to his left, dropped a 17-yard laser to Hunter Renfrow in traffic for a touchdown in a 49-21 win over Georgia Tech. It was a throw that incumbent starter Kelly Bryant never quite had in his arsenal, and soon after, Bryant announced his intention to transfer from the Tigers. The prized freshman, the No. 1 recruit in his class, adds another potent weapon to an already loaded Clemson team. Clemson’s offensive line looked to be a weakness in a two-point win over Texas A&M, but then the same unit looked significantly better against the Yellow Jackets. A key to this game will be how the offensive line holds up against a significantly improved Syracuse line that racked up six sacks against UConn last week. 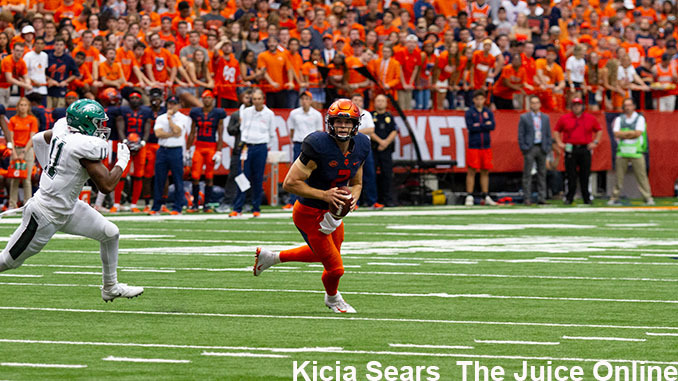 In the end, I expect Eric Dungey to match Lawrence as the Orange give the Tigers a scare, playing them within a single score until late in the fourth quarter. But look for Clemson to pull away in the end, riding its home field advantage, resulting in a 38-28 loss for Syracuse, dropping them to 4-1. Would a 6-6 season be a disappointment for Syracuse football?